OK – I am not going to make a habit of product endorsements (of mints, or anything – this is a restaurant blog!) but I have to shout out a new item. I am not a candy person – but when I see a new candy my curiousity gets the best of me. 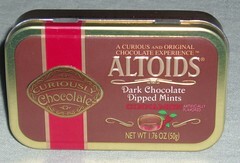 Dark Chocolate Dipped Cinnamon Altoids ROCK!!!!!!! I tried peppermint as well but cinnamon ROCKS!!!. The chocolate is good quality and balances the bite of the cinnamon. Kind of like a chocolate covered red hot. This entry was posted on January 29, 2007 at 10:24 PM	and is filed under food. You can follow any responses to this entry through the RSS 2.0 feed. You can leave a response, or trackback from your own site. I’m glad they didn’t do it to the mint ones. That would be like covering an iron fist with a velvet glove.